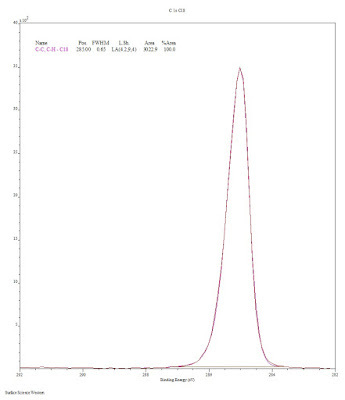 The C 1s spectrum of polyethylene shows vibrational structure that leads to an asymmetric peak-shape. If this vibrational structure is not accounted for it can lead to an erroneous assignment of C-OH, C-O-C or an overestimate of contamination/oxidation species. 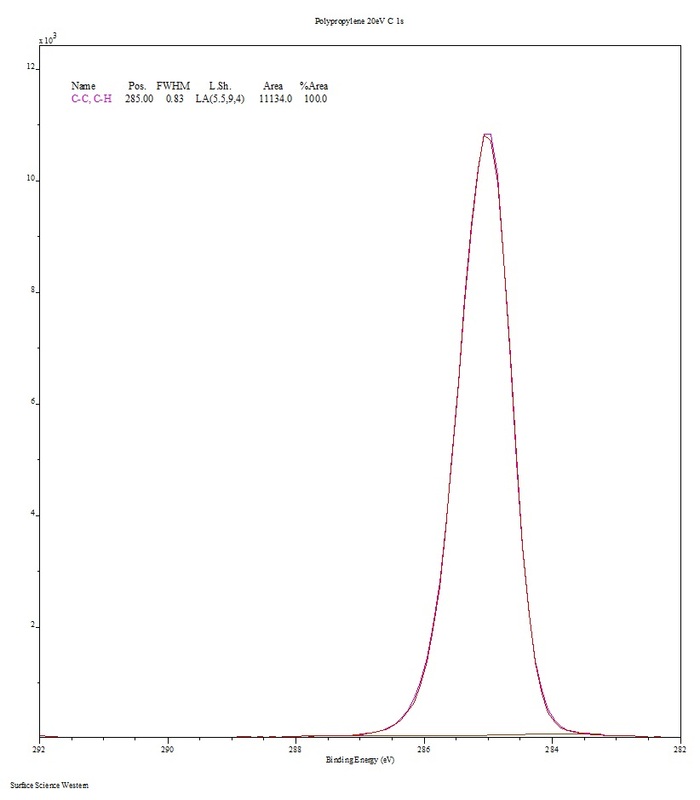 A fitting of a series of polyethylene standards (Figure 1) as well as a fitting of a C18 alkane (Figure 2) on a clean silicon wafer gave consistent peak-shape results and were fit with an asymmetric peak-shape defined in CasaXPS as LA(4.2,9,4) and with peak widths of 0.64-0.65 eV (at 10 eV pass energy) and 0.67-0.68 eV (at 20 eV pass energy). Peak fitting parameters for PE surfaces with small amounts of oxidation and/or contamination are presented in Table 1 and an example is shown in Figure 3. Table 1. Contaminated/oxidized polyethylene surface C 1s fitting parameters. Figure 1. 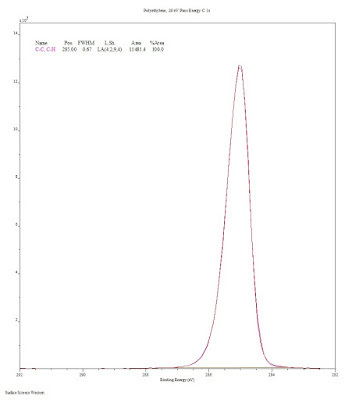 C 1s spectrum of a standard polyethylene sample (20 eV pass energy). Figure 2. 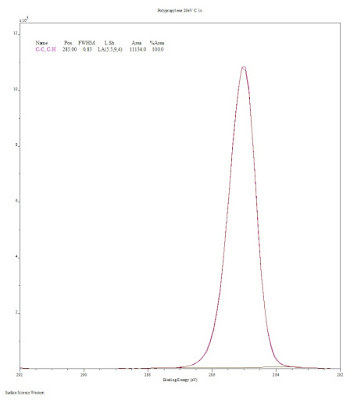 C 1s spectrum of C18 alkane (10 eV pass energy). 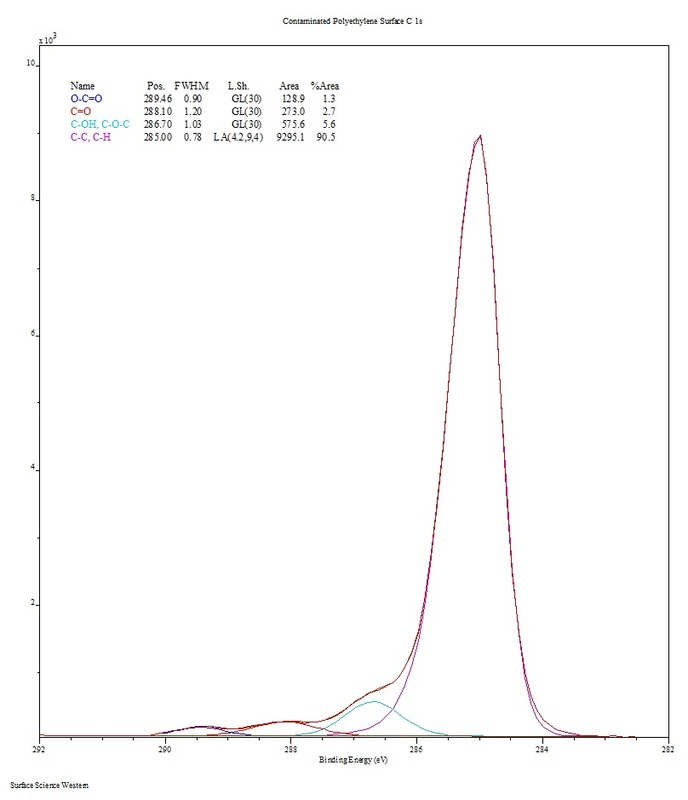 Figure 3. 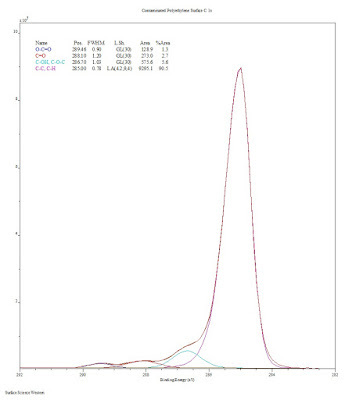 C 1s spectrum of a contaminated/oxidized PE surface using the fitting parameters from Table 1. 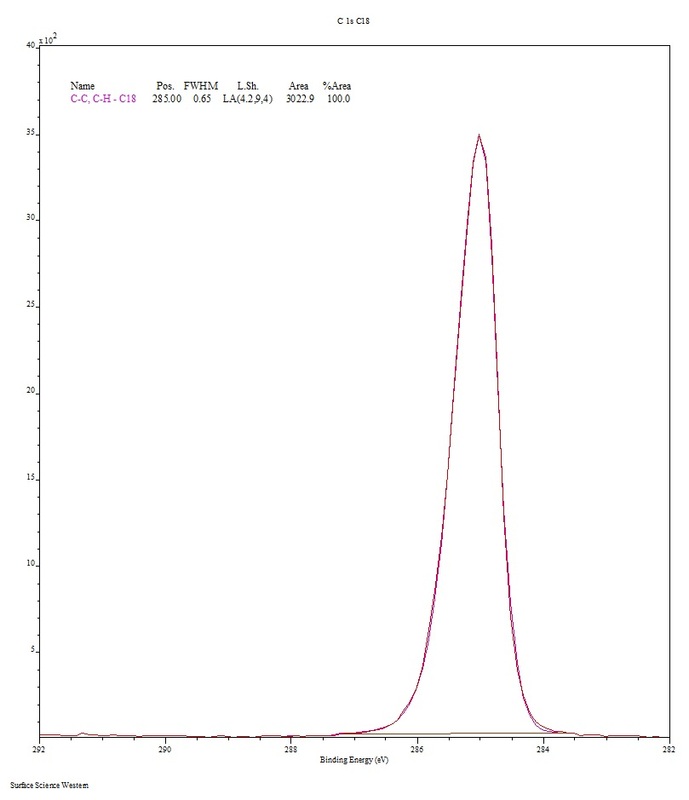 A similar analysis of polypropylene (Figure 4) gave a peak that can be fit with an asymmetric peak-shape defined in CasaXPS as LA(5.5,9,4) and with peak-widths of 0.82 eV for a 10 eV pass energy and 0.83 eV for a 20 eV pass energy. Figure 4. 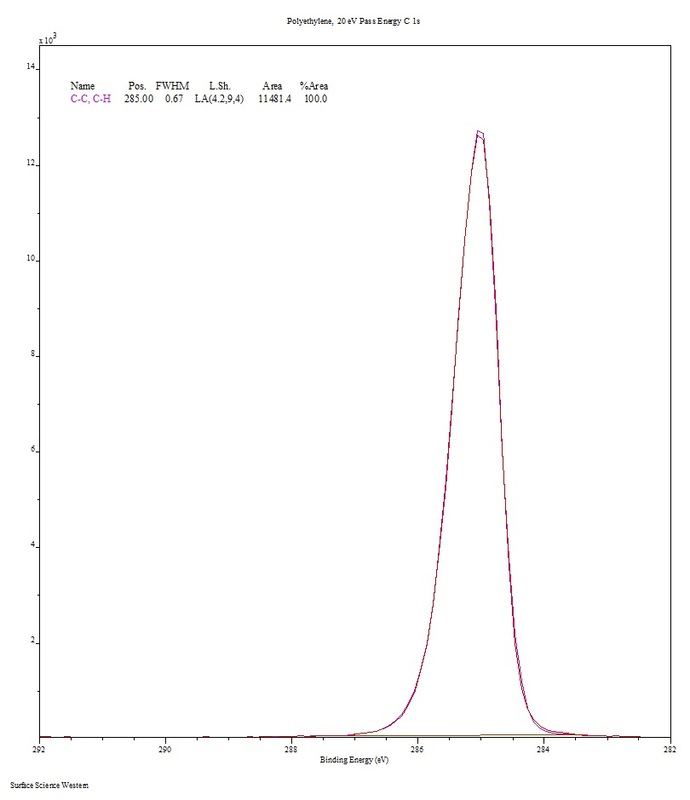 C 1s spectrum of a standard polypropylene sample (20 eV pass energy). M.J. Walzak, pers. comm. 2015.